Episode: 61. Site Numbers: 155, 207, 302, 453. Date Posted: 17 May 1998. Update 17 March 2000. Location: Hambledon & Cardiff, UK. Type: Houses. William Lashly was a member of both Scott expeditions. A remarkable man known as much for his modesty as for his strength and sledging abilities, "Stoker" Lashly, along with Tom Crean, managed to get the scurvy-afflicted Lt. Evans back to Hut Point after leaving the polar party on January 4, 1912. It was a touch-and-go seven-week journey that earned both men the Albert Medal of the Royal Geographical Society. Many have speculated that if Lashly had continued with Scott to the pole the final outcome might have been different. For book collectors Lashly is best known for his Diary, one of the great and elusive rarities of Antarcticana. 75 numbered copies of this slim volume were issued by the University of Reading in 1938-39 "for private circulation." In 1996 a copy fetched $6250. The diary (along with Lashly's Discovery diary) was published with additional material by Gollancz and Taplinger in 1969 under the title Under Scott's Command: Lashly's Antarctic Diaries, edited by Commander A. R. Ellis. Lashly was born in Hambledon near Portsmouth in Hampshire. In 1932 he returned to this village and built a house (207) which he called Minna Bluff, after the peninsula that juts out from Mt Discovery 46 miles south of McMurdo Station (and named for Sir Clements Markham's wife, Minna). The house still stands on West Street, owned now by an elderly couple who bought it from Lashly's daughter in 1941. The name Minna Bluff still graces the entrance gate. The house is an attractive though modest brick, hipped-roof building set back from the road. 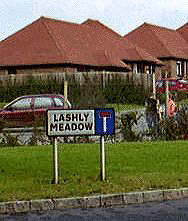 The Lashly name is perpetuated in the village by Lashly Meadow, a road serving a new housing estate (302). Another Lashly house may be found in the western section of Cardiff at 17 Mayfield Avenue (155). Following the First World War, Lashly was offered a job with the Board of Trade in Cardiff. 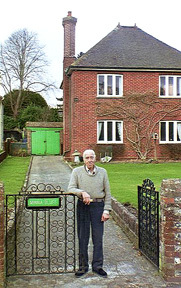 He lived here until his return to Hambledon in 1932. Number 17 is in a row of well-preserved and architecturally interesting two-story brick terrace houses. Update 17 March 2000: Markham gives 18 Dumbarton Street, Buckland, Portsmouth (453), as Mrs Lashly's address at the time of the Discovery expedition (Antarctic Obsession, p. 96). Edgar Evans lived in Buckland as well; the area of the address (52 Chapel Street) was extensively redeveloped, the house being demolished, suggesting that the same may have been the fate of Lashly's house. Dumbarton Street itself is not shown on modern maps.